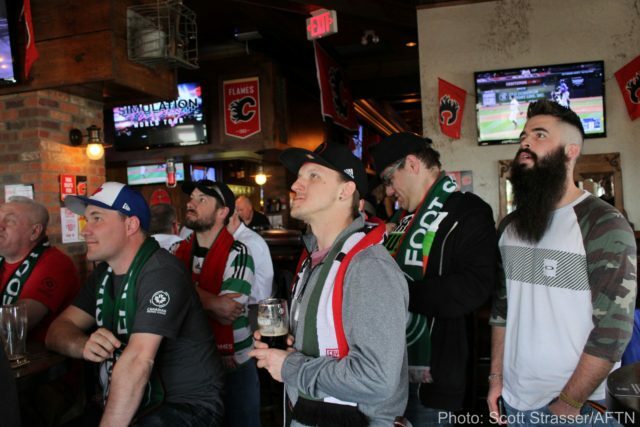 Dozens of Cavalry FC fans packed into Kildares Ale House in south Calgary on April 4 to catch a first glimpse of their team’s home and away kits. As pints and appetizers were consumed, less than a kilometre away from Cavalry’s home stadium – Meadows on the Green at Spruce Meadows – fans watched a livestream of a Canadian Premier League fashion show in Toronto, where players from all seven competing teams revealed the inaugural jerseys, as well as training wear. Fans cheered as the players emerged, donning their respective jerseys and walking the catwalk as well as some of New York City’s finest models. (Perhaps not quite as well, but you get the picture). Cavalry’s home kit features a red jersey with a white diagonal slash, along with black shorts and socks. According to a press release from the club, the look is inspired by Lord Strathcona’s Horse (Royal Canadians) regiment uniform. The red is also a testament to Calgary’s sporting culture, as the city’s other professional sports teams – the Flames, the Stampeders, and the Roughnecks – all don the colour as well. The away kit differs entirely from the home kit, however, featuring white shorts and a camouflage green jersey that boasts a similar shade to Canadian Forces uniforms. Both kits also feature a C-shaped horseshoe on the lower back. 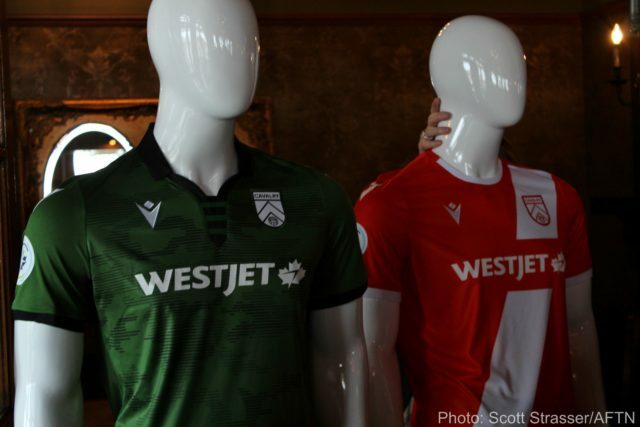 The main jersey sponsor for Cavalry FC is Calgary-based airline WestJet, who announced their pleasure at being the kit sponsor on Twitter. The jerseys will be available for purchase at shop.canpl.ca. The adult jersey costs $119.99, while the youth jersey costs $99. 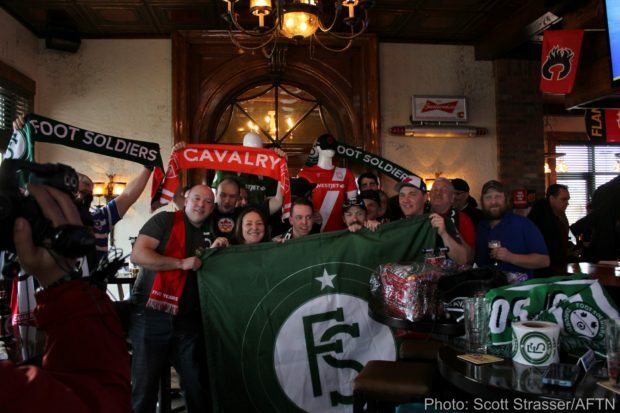 Among the many fans who attended the kit reveal viewing party at Kildares was Foot Soldiers SG member Richard Lewis. He said he liked both Cavalry’s home and away kits, adding he’ll probably end up purchasing both. Also in attendance at the kit reveal party were five members of the South City Squadron, who most likely had the longest drive of anyone at Kildares. Coming up from Lethbridge, SCS organizer Sam Epp echoed Lewis’ comments. Epp said he enjoyed the manner in which the CPL decided to unveil the kits, opting to reveal them with a live-streamed fashion show. 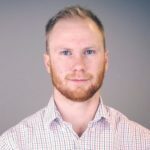 Yet another attendee was Ryan Christoffersen, one of the founding members of the Foot Soldiers SG in 2015. He said the kit reveal party was a league-wide success. 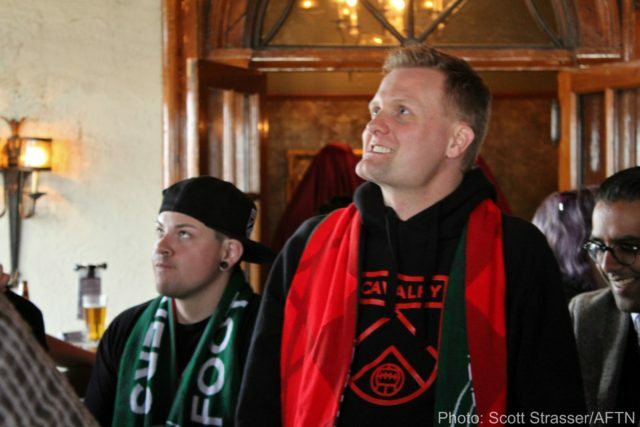 Along with the livestream, attendees also got to see the kits on mannequins, as well as some new supporter-created artwork that features Cavalry FC head coach/general manager Tommy Wheeldon Jr. Earlier in the day, Cavalry’s home kit had been leaked online. 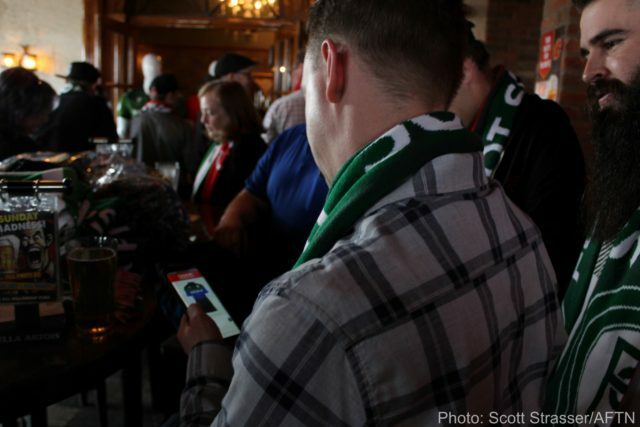 But attendees at Kildares claimed they tried to avoid seeing it prior to the viewing party. Like Epp, Christoffersen said he didn’t go looking for the image of the leaked kit either.